This week, Brentwood took center stage as Hollywood entertainment folks looked to unload their homes in the pricey Westside neighborhood. A sprawling compound once home to both Cher and Eddie Murphy is the latest target of another price reduction. The 14-acre estate has relisted at $48 million, down from its original ask of $85 million in 2016. Originally built for Cher, the property includes a 20,000-square-foot mansion, tennis court, cabana and five horse stables. Combined, there are 11 bedrooms and 17 bathrooms on the property, the Los Angeles Times reported. The current owner, Vicky Walters, and her late husband, real estate developer Raul Walters, bought the home from Murphy in the 1990s. It most recently listed at $69 million. Actor and comedian Jim Belushi listed his Brentwood villa for $28 million. He shaved about $10 million off the original ask after removing an adjoining half-acre lot. The “According to Jim” star has been shopping the 11,800-square-foot mansion on South Burlingame Avenue since 2017. It includes six bedrooms, 11 bathrooms and a screening room. Outside, a guesthouse and swimming pool complete the grounds. Belushi paid $8.3 million for the property more than a decade ago. 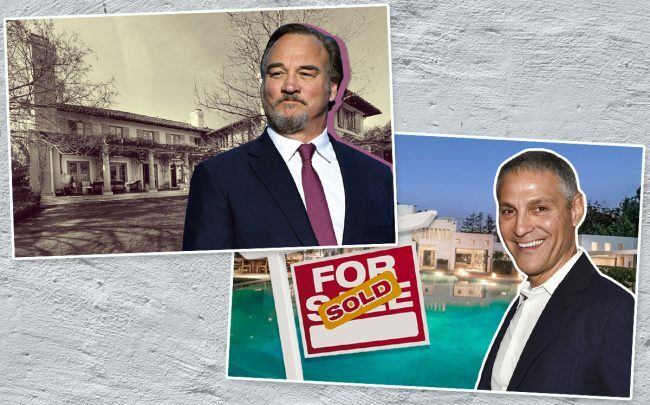 Agent-to-the-stars Ari Emanuel seems to be having better luck in Brentwood, however. The William Morris Endeavor co-CEO sold his estate for $19.4 million roughly four months after listing. He also got above asking price, a rarity in today’s world of constant discounts. David Brown bought the 8,000-square-foot home, which includes five bedrooms and a guesthouse. Emanuel paid $17 million for the home in 2015, records show. In Montecito, the widow of billionaire Discount Tire founder Bruce Halle is shopping her 8,000-square-foot estate for $12.5 million. That’s about half the amount the couple invested in the property. Diane Cummings Hall, heiress to the Sara Lee company, and her late husband paid $16 million for the pad in 2016, later pouring in about $8 million for renovations. Sitting on 2.7 acres, the home includes three bedrooms and five bathrooms. It also features ocean views.